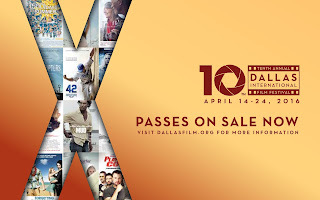 Dallas, TX (March 3, 2016) – The Dallas Film Society today announced the initial ten official selections for the 10th edition of the Dallas International Film Festival. The list of titles are led by the Centerpiece Gala selection of Chris Kelly’s OTHER PEOPLE and include two world premieres (Johnathan Brownlee’s THREE DAYS IN AUGUST and William Kaufman’s DAYLIGHT’S END), and a U.S. premiere (Asiel Norton’s ORION). DIFF has also announced a special event concert and screening of the family classic E.T.– THE EXTRA TERRESTRIAL, celebrating the career of legendary film composer John Williams. Two films – both locally shot and produced - will make their world premieres at DIFF. American artist who is forced to confront her past when both sets of parents come together over a weekend for her to paint a family portrait. Willliam Kaufman’s DAYLIGHT’S END is the rare action/horror thriller that makes it into a non-genre competition at a film festival, as it screens in the Texas Competition. It stars Johnny Strong, Lance Henriksen, and Louis Mandylor in a hard-driving action-horror-thriller about a rogue drifter who agrees to put aside his mission of vengeance to help rescue a desperate band of survivors in an abandoned police station, as they struggle to defend themselves against blood-hungry creatures that used to be human. Asiel Norton’s ORION will make its U.S. Premiere at DIFF. Starring David Arquette and Lily Cole, the post-apocalyptic tale takes place in a desolate, future world, where a wanderer fights to save a virgin mother from a powerful magician and, with her, searches for a mythical city containing the world's last survivors. As in past years, DIFF will treat Dallas audiences to their first opportunities to see some of the top films out of this year’s Sundance Film Festival, as well as a chance to catch the films they possibly missed in Austin at SXSW. Joining OTHER PEOPLE, additional films out of Sundance include: Rokhsareh Ghaem Maghami’s SONITA, the winner of the World Cinema Documentary Grand Jury Prize and Audience Awards, about a teen Afghani rapper facing the possibility she may be sold into marriage; Natalie Portman’s take on Amos Oz’s autobiographical tale, A TALE OF LOVE AND DARKNESS; Werner Herzog’s exploration on how we are faring in the digital landscape and online world – LO AND BEHOLD, REVERIES OF THE CONNECTED WORLD; and WEINER, Josh Kriegman and Elyse Steinberg’s documentary on embattled former Congressman Anthony Weiner’s campaign to be mayor of New York. Keith Maitland’s TOWER will head north following its screening in Austin this month. Through archival footage and animation, the film recounts the mass shooting at the University of Texas in 1966. Rounding out the initial list of ten selections is Johnnie To’s OFFICE, as DIFF demonstrates its continuing commitment to showcase great Asian cinema and filmmakers with the legendary director’s first musical, based on star Sylva Chang’s hot stage play set against the backdrop of the 2008 financial collapse. The Dallas International Film Festival has also built a reputation over the past decade for pulling out all the stops for one-of-a-kind special events with film and cinema as the theme. This year one of those events will be a special concert and screening celebrating the career of award-winning composer John Williams at the Dallas City Performance Hall on Saturday, April 16. The Dallas Winds, also honoring a significant anniversary – their 30th, begin the afternoon with a performance of some of Williams’s signature works. A Q&A with Dallas Winds Artistic Director and Conductor, Jerry Junkin, will follow as the Hall is prepared for a special screening of Steven Spielberg’s family classic, E.T. – THE EXTRA TERRESTRIAL. The event is a nod to DIFF’s association with the American Film Institute during the first few years of the film festival, as Williams is this year’s AFI Life Achievement Award honoree. Based on Amos Oz's international best-seller, A TALE OF LOVE AND DARKNESS is the story of Oz's youth at the end of the British Mandate for Palestine and the early years of the State of Israel. The film details young Amos' relationship with his mother and his birth as a writer, looking at what happens when the stories we tell, become the stories we live. Herzog chronicles the virtual world from its origins to its outermost reaches, exploring the digital landscape with the same curiosity and imagination he previously trained on earthly destinations as disparate as the Amazon, the Sahara, the South Pole and the Australian outback. Working with NetScout, a world leader in real time service assurance and cybersecurity, Herzog leads viewers on a journey through a series of provocative conversations that reveal the ways in which the online world has transformed how virtually everything in the real world works - from business to education, space travel to healthcare, and the very heart of how we conduct our personal relationships. The Dallas Film Society celebrates films and their impact on society. A 501(c)(3) non-profit organization, the Dallas Film Society recognizes and honors filmmakers for their achievements in enhancing the creative community, provides educational programs to students to develop a better understanding of the role of film in today’s world, and promotes the City of Dallas and its commitment to the art of filmmaking. The annual Dallas International Film Festival is a presentation of the Dallas Film Society and has been named by Movie Maker Magazine as one of the “25 Coolest Film Festivals in the World.” In addition to producing one of the largest festivals in the Southwest, the Society produces numerous year round events, screening series and programs in partnership with arts organizations around the city. The offices of the Dallas Film Society are located at 3625 North Hall Street, Suite 740, Dallas, TX 75219. For more information about the Dallas Film Society and its ongoing events, visit www.dallasfilm.org or call (214) 720-0555. DART allows commuters to navigate around Dallas and 12 surrounding cities with modern public transit services and customer facilities tailored to make transportation fast, comfortable and economical. The new DART to DIFF partnership is making it even easier for 2016 Dallas International Film Festival-goers to quickly and safely travel from the 2016 DIFF hub in Mockingbird Station to exciting events around the city. As the main public transportation provider in Dallas, DART is the perfect partner for the 2016 festival and a vital resource for movie-goers. In addition, DART pass and ticket holders will receive $2 discount off DIFF regular ticket prices when purchasing tickets at the DIFF Box Office in Mockingbird Station.